What if you had to kill to save an innocent life? Could you commit terrible crimes for a noble cause, and still come out a good person in the end? What if it was for love? Is a happy ending even possible after you've thrown away your humanity? 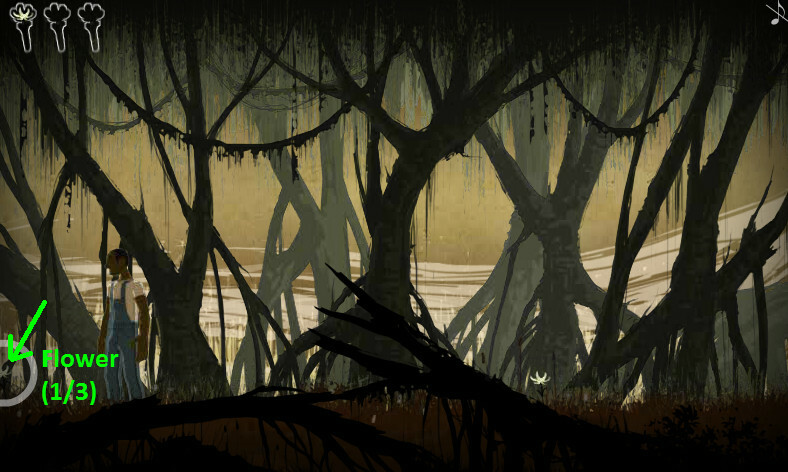 The Price, an artsy point-and-click story by Flip-N-Tale, asks these questions... and the answers it provides might not be very happy ones. 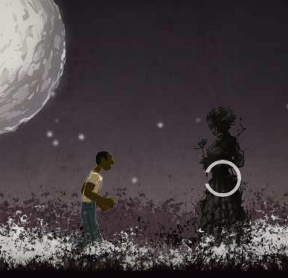 Set in the American South during the time of slavery, the game opens with the tale of a field laborer who's fallen in love with the baron's daughter. When they're caught together, she takes a bullet defending him and he's left with no choice but to run. If he becomes one with an evil spirit and reaps three wicked souls, he can save her	 though the hard part isn't killing, it's staying in control. 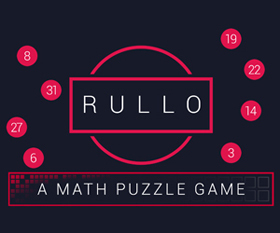 Explore three different levels, clicking the highlighted objects to progress, and solving puzzles to reach your intended victim. Will the spirit break free, or will you be able to remember why you're doing this in the first place? The world of The Price is never a pleasant place to be, but it's gorgeous. It looks more like a painting than a game, and the environments are so rich and detailed that you can practically feel the breeze outside or choke on the dust in the mines. Each character is beautifully and uniquely animated, even the ones who don't show up for very long. The music is generally on the simpler side, but does a great job setting the mood and grounding the visuals to the setting and plot. And while the story isn't perfect (the justice the protagonist metes out should be important, but the matter is barely touched) it's still pretty good. This game is dark and miserable and bloody and tragic, and even when the protagonist has hope in thinking of his lover, it's hard to believe that things will work out for him. The sudden ending hits like a sledgehammer in a way that's horrible and perfect at the same time. There are monsters in this story, but no perfect people... yet every sympathetic character gets to speak their case, and the game is much better for it. However, this isn't a game for everyone. The violence and slavery will alienate some players, and not everyone will agree on whether that subject matter was well-handled. The gameplay doesn't come off very strong when compared to the other elements, either. 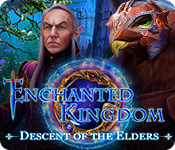 Some of the mechanics are tricky and very abruptly introduced, and the more positive ending was difficult to find-- in other words, the developer does show promise, but this is a game to play for the art and story. 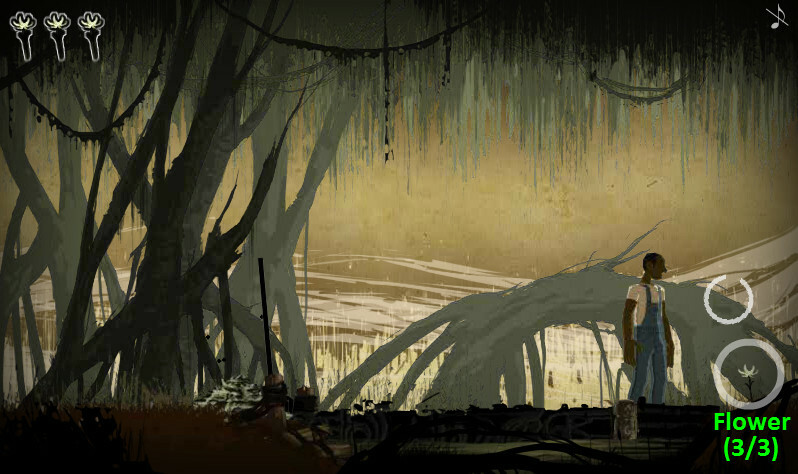 But if you're interested in beautiful visuals and an unsettling story with a folktale-like feel, you might want to see what happens when you pay The Price. The Price Walkthrough now available! 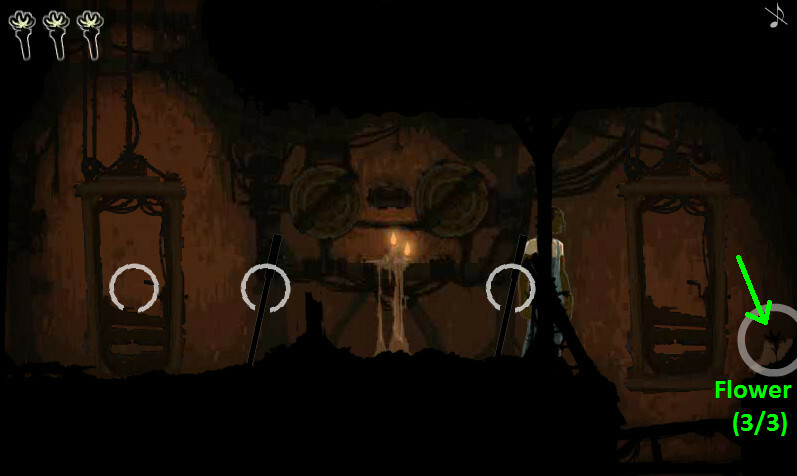 You start the game at the main area where you can select one of three chapters to travel to. Although you can visit them in any order, each chapter will get progressively more difficult in whatever order you decide to complete them. 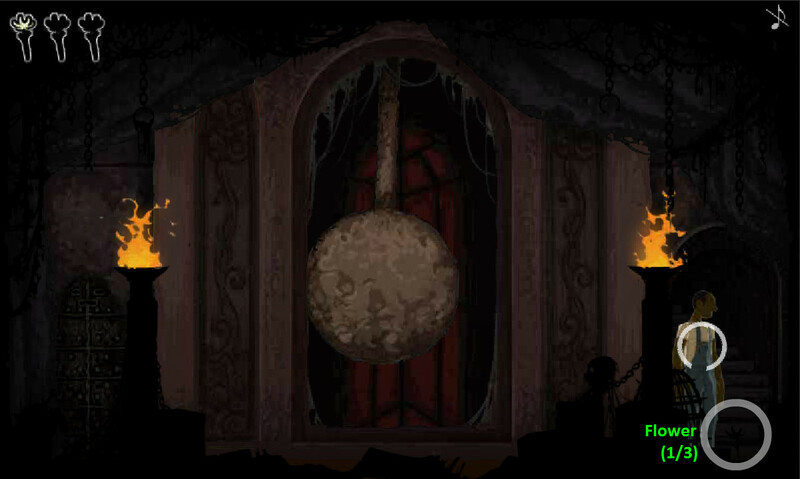 The hanging noose on the left takes you to Chapter 1 (The Caverns), the angel statue takes you to Chapter 2 (The Mansion), and the raven on the skull post goes to Chapter 3 (The Swamp). Each chapter contains 3 White Flowers hidden somewhere within the level. 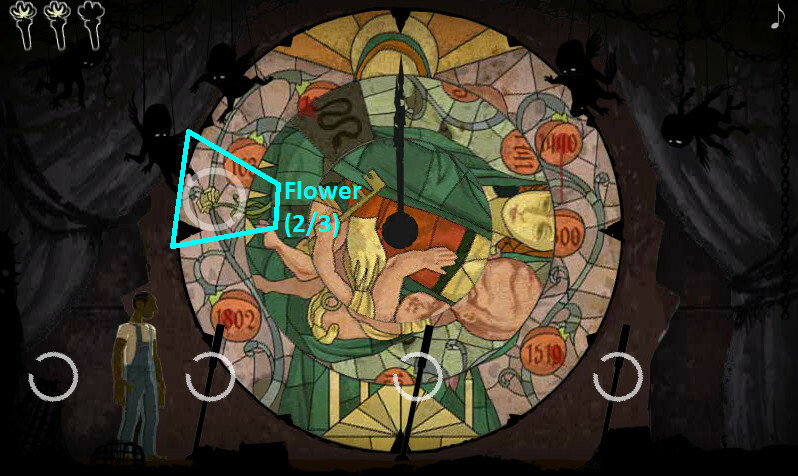 The purpose of the flowers is to slow down the spinning circles in the boss encounter minigame at the end of the chapters. A) Clicking all of the circles quickly rotating clockwise. B) Moving the cursor without clicking over the circles slowly spinning counter-clockwise. Pay attention to your character's attack animations after he transforms to determine the result. A successful attempt will cause your character to kill the enemy with a simple slashing animation (contributing to the good ending). However, if you fail your character will use a much more gruesome attack against the enemy (contributing to the bad ending). It would be very challenging if not impossible to win at the later boss encounter minigames without collecting the White Flowers to slow the circles, so make sure you've located each flower in the chapter before starting the fight! The "Bad Ending" is much easier to get. When the boss fight starts, you can simply move the cursor away from the scene to avoid all of the circles. Walk to the right until you reach the elevators. Click the left elevator to ride it to the upper level. Move all the way to the right. Collect the White Flower 1/3 on the floor beside the candles. Go all the way to the left wall. At the bottom left corner of the tunnel, if you look closely, you can make out the black silhouette of another flower. Click it to collect the White Flower 2/3. Move right towards the two levers. Select the left lever, then rapidly click the flashing circle to spin the wheel. 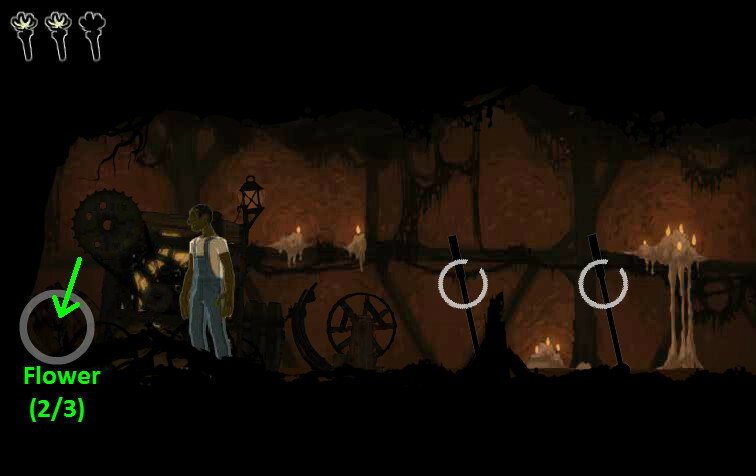 Once the wheel is spinning at a fast pace, release the left lever and quickly click the right lever. The right lever will raise a mechanism that strikes the spinning wheel, sending the machinery and gears at the left side of the room in motion. Return to the elevator and ride it back down to the ground level. Go right to the levers between the two elevators. Pull the right lever to turn the right wheel on the wall so that its bar is aligned horizontally. Quickly move to the left lever and pull it before the right wheel resets. When the bars on both wheels are simultaneously aligned horizontally, the right elevator will be activated. Walk all the way to the right, but do not yet get on the elevator. 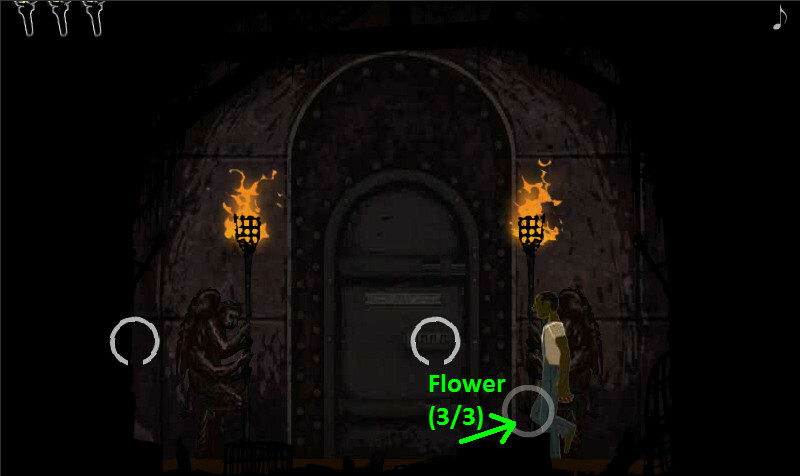 On the ground on the right side of the right elevator you will find the black silhouette of another White Flower (3/3). Click the right elevator to ride it down to the bottom floor. When you reach the bottom floor, the boss encounter will begin automatically. Follow the instructions that appear at the start of the minigame: select the icons as they appear at random locations around the screen. You must click the circles that are quickly spinning clockwise before they disappear. 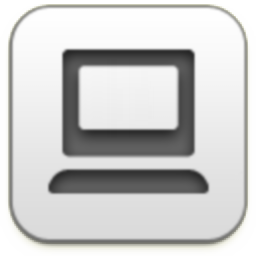 However, when the icon is slowly rotating counter-clockwise, move your cursor over the icon but do not click it. 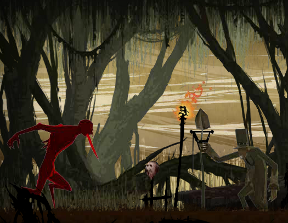 If you are able to successfully complete the minigame, your character will simply slash at the enemy to destroy them. However, if you fail, your character will kill your opponent much more violently. Once the brief cutscene after the boss fight is complete, run to the right through the field and then click the statue. Collect the White Flower (1/3) on the ground directly in front of the stairs. Climb the stairs to go to the upper floor. Use the three levers to stop the spinning discs at the correct positions. Select a lever to hold it, then click it again to release it. Once the lever is released, its corresponding disc will lock in place. Note that the disc does not immediately stop moving. Instead, it keeps rotating until it reaches the nearest position indicated by the black arrows around the edge of the circle. The left lever controls the smallest disc in the center, the middle level controls the medium disc in the middle, and the right lever controls the large outer disc. If you look closely at the outer and middle rings, you'll see the pieces of a White Flower. Use the levers to position the rings and align the two halves of the flower together, then click the White Flower (2/3) to collect it. Now click and release the third lever to reset the discs and start the puzzle. Use the levers to pause the rings at the correct spots and align all three pieces of the stained glass mosaic. Once the puzzle is solved, a secret passage downstairs will be revealed. 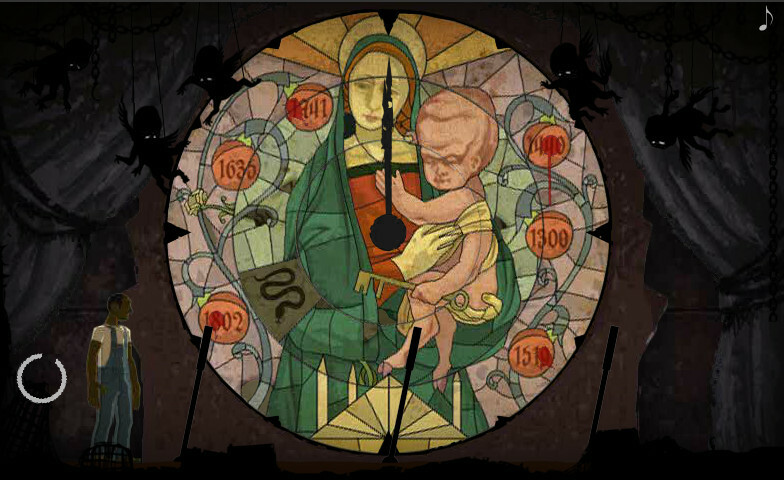 Examine the numbers on the face of the clock that are stained with blood. Each highlighted number is at a different spot within its 4 digit combination. The first bloodstained number is 1 in the combination 1941. The second bloodstained number is 8 in the combination 1802. The third bloodstained number is 4 in the combination 1440. The fourth bloodstained number is 9 in the combination 1519. Wait until the clock hour reaches the times indicated by the blood stained numbers, then take note of the symbol that appears in the window at the lower left side of the clock face during that time. At 1 o'clock the symbol in the window is a Sun. At 8 o'clock the symbol in the window is a Lightning Bolt. At 4 o'clock the symbol in the window is a Sun. At 9 o'clock the symbol in the window is a Snake. Go down the stairs to return to the first floor, then click the gap to the left of the giant pendulum to enter the secret passage. Click the black silhouette of the White Flower (3/3) at the very bottom of the right statue's torch. Click the center of the large metal door to zoom in on the lock. Enter the combination of symbols you found from the clues on the clock upstairs. The door will open automatically when the right combination is set, allowing you to enter the laboratory for another boss encounter. Just like before, click the circles that quickly spin clockwise. 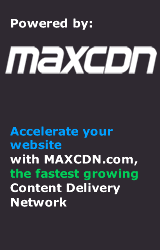 Move your cursor over circles slowly spinning counter-clockwise but do not click them. After the fight is over, you will be returned to the field again. Walk right and click the statue again to complete the chapter. 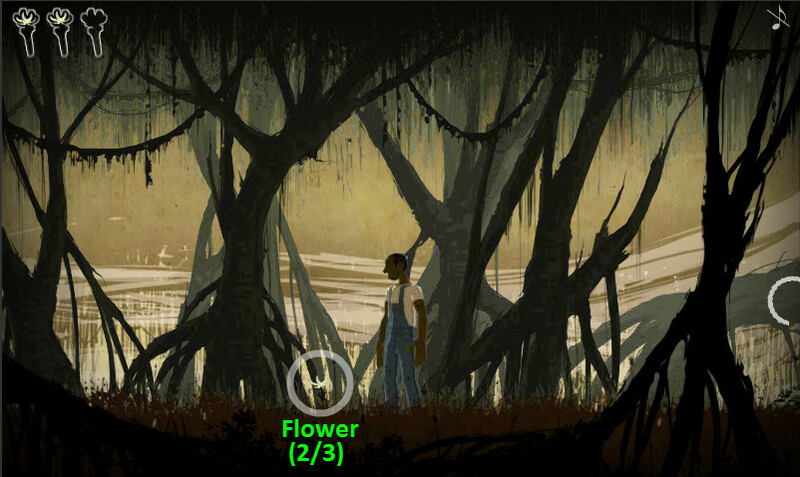 Walk all the way to the left and collect the White Flower (1/3) at the very edge of scene. Move to the right until you pass the silhouette of the fallen tree in the foreground. Collect another White Flower (2/3) growing in the middle of the grass. Continue right to the edge of the water. Click the pitchfork to start the minigame. 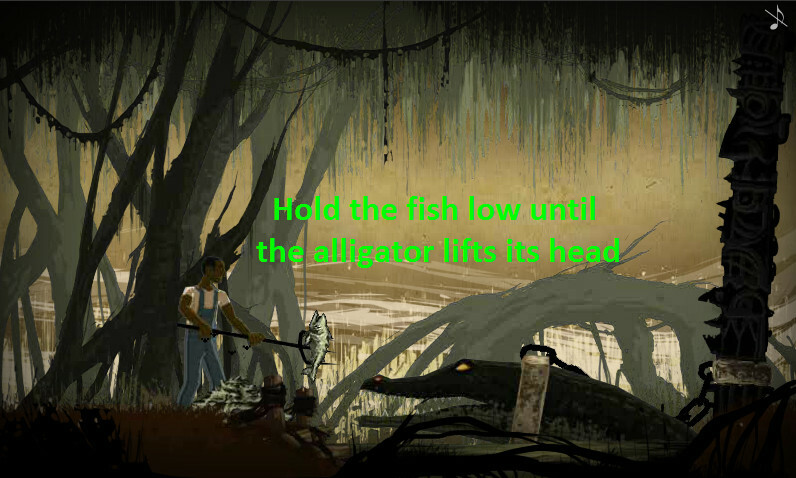 Use the dead fish at the end of pitchfork to lure the alligator in the water. Holding the pitchfork low by moving the cursor down will make the alligator move towards you and then lunge at the food. When the alligator lifts its head up but before it has a chance to take a bite, quickly move the cursor upwards to lift the pitchfork. The alligator will bite at the air and miss the fish, pulling at its chain attached to the totem pole. 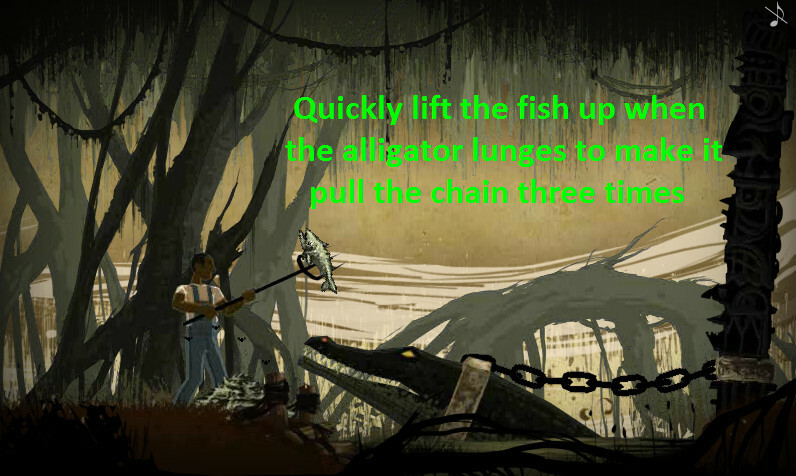 After the alligator misses the fish three times, it will collapse the totem pole, allowing you to safely cross. 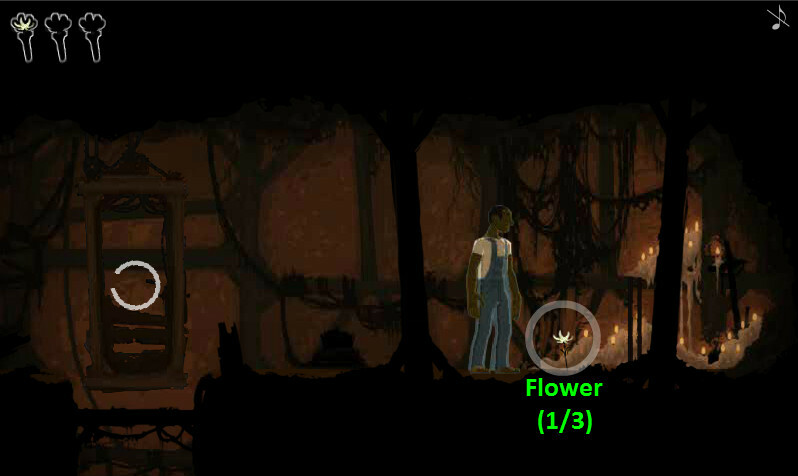 Walk across the totem pole, then collect the White Flower (3/3) in the grass on the other side. Continue right to the next boss encounter. As in the previous two fights, click the circles that quickly spin clockwise. Move your cursor over circles slowly spinning counter-clockwise but do not click them. After the encounter is over, you will be returned to the field one last time. Walk right and click the statue to completely restore it. I hit a bug in the second world. Once you solve the clock puzzle, if you leave and return (which is inevitable given the next puzzle), the circle that allows you to exit the clock room does not reappear, leaving you stuck in the clock room. I'm using Windows 7 and Chrome. I'm trying to replicate the bug (I also have Windows 7, and I've tried both Chrome and Firefox), but the game isn't doing that for me. Have you tried refreshing the page, and selecting "Continue" when the game reloads? Wow... given the visual style and the amount of work that probably went into making this, I want to say nice things but I can't. I'm not going to go nuts on the critique but my main gripe is playing a game on my PC that is obviously intended for a touch screen. As for the rest, it's a shame because this could have been a lot better. The game is beautifully done and working fine on my PC. 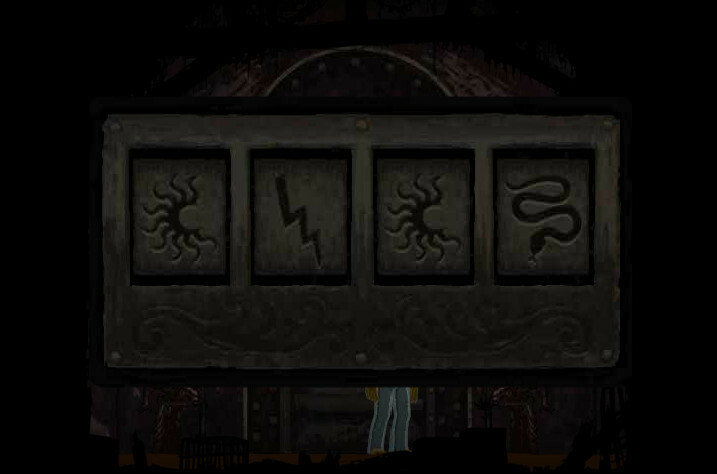 Unfortunately, I'm stuck on the sun/serpent/lightning puzzle. ack. seriously, what are those little white flowers for? what do they do?? but i was too lazy to try. I refreshed and reentered the game. The second door is open, and I can enter and leave the clock room, but the clock is now scrambled and none of the levers are selectable. I'm sorry, I don't know what to say or how to fix it. If you still want to play, you could try starting a new game to see if that bug happens again? Since you can do the areas in any order you choose, it wouldn't take long to see if the same thing happens again. You also could try playing in a different browser, if you have one. Yeah, I just restarted and I've played through a couple times (trying to get the good ending). The bug hasn't happened again - not sure what caused it. On the first world, I can't get the right elevator to activate. I pulled the right lever, and immediately pulled the left one. Both were horizontal. The left one then went back to resting position, followed by the right. The elevator doesn't work. Have you activated the mechanism on the upper floor yet? The right elevator won't be operational until you've started the machinery upstairs that powers it. For the second boss, did anyone else have the circles just rapidly move around the screen, rather than stay in one spot for any amount of time? Each circle was only on my screen for about half a second. I can't imagine collecting the flowers is THAT necessary. The artwork is great, but the character animations feel kind of slow and laggy to me. Also, for as nice as the still pictures are, they look really blurry. As for the controls, well... I think they would have been better off instead have clockwise and counterclockwise buttons, they actullay had different icons pop up. I immediately forgot which button I was supposed to press and which I was supposed to hover my cursor over. One last thing, I would have liked a bit more backstory anout the three criminals. Aside from being mad scientists and cannibals, there wasn't much of an explanation for who they are. Great game, though. Love the art and the story. Good story and style, but this game needs more play-testing, and perhaps more depth. For one, the movement of "run for a second then walk the rest of the way" was frustrating. Second, on a darker screen (such as my macbook), most of the flowers are impossible to see. Finally, the good ending/third circle clicking game is too hard, especially on trackpad. Looks really beautiful, I liked playing it quite a lot. Would've liked the possibility to go back and try a world again, or to save before each world. It would make the good ending easier to reach (I missed one or two little circles in my second battle, despite all the 3 flowers...). 2 stars, max. The impossibility of getting a good ending ruins it. Oh my gods, the first time I failed to get the good ending (from the last boss, no less -.-) I thought that I would have to restart the entire game again EACH time I failed - wasn't ready to be happy. Still, even with that, I still had to retry that last stage several times - the difficulty jump was a cliff, and if not for the fact that I didn't have to redo the entire game again, I'd probably quit a long time ago. That said - the "good" ending is seriously worth trying to get. Yes, it is 'predictable' once you get the "bad" ending what the good ending might be, but... it's still worth getting. While I was complaining about the sheer difficulty of getting the good ending... well, in retrospect, that is a good symbolization of the internal fight that this man must have made - after all, he had to fight for his humanity, and fight a literal demon who would thirst for blood and jealousy. Still a sad ending in any way, but at least another soul got saved. For now. That's a great tip for anyone who's looking to get the good end (I did something similar.) Thank you for sharing! Great analysis on the endings, too. Struggling to get the best end was aggravating, but also powerful in a way. It helped me empathize with the protagonist much more, and gave me so much respect for him in the good ending. It probably wasn't easy for him to just walk away, but he still did it. I think a testing phase could have cleared up some of these problems-- an in-game way to repeat a fight would have been great-- but I really do respect the basic idea behind the difficulty. Insert Twisted Sister reference here. Man I cannot get over how beautiful and simple the music is.